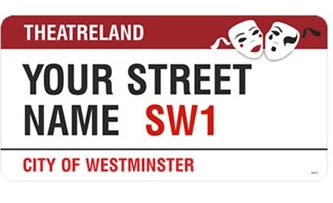 The West End is the home of London’s entertainment scene, filled with theatres, cinemas, clubs and restaurants. A number of posters were created London Underground to encourage people to visit the area at the weekend and after work to help cut congestion during the rush hour. London Transport Museum is based in Covent Garden in the heart of London’s West End, specifically in the area known as Theatreland which is indicated on street signs by featuring a comedy tragedy mask – a classic representation of stage and theatre. 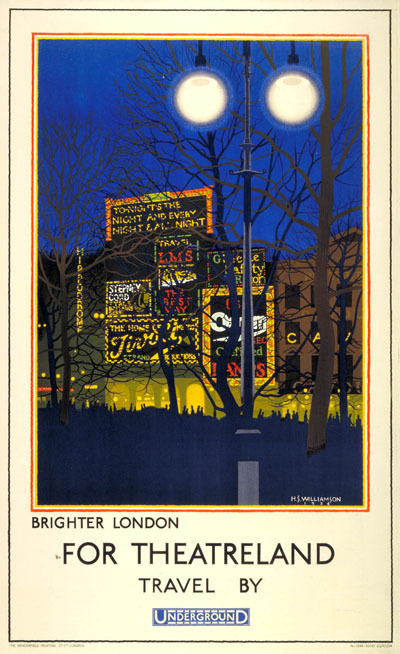 This week’s poster of the week is Brighter London for Theatreland by Harold Sandys Williamson in 1924 designed to bring the crowds in to London’s theatres, aided by the Tube of course. Many of Williamson’s designs feature vibrant and intense colours used to draw the viewer’s attention. The West End has been particularly popular since the early 19th century when it was favoured by the rich because it was located upwind of smoke drifting from the City. This part of the city remains so exciting that it is officially the most expensive place in the world to rent commercial property. Along with Broadway in New York, the West End is well known for presenting some of the highest quality theatre productions in the world, with many famous film actors treading the boards in recent years to enhance their thespian image! The first theatre in London was constructed in 1576 and was known to have been used by William Shakespeare’s company. The first theatre to be built in the West End however opened in 1663 on the site of what is now known as the Theatre Royal on Drury Lane, designed by highly celebrated architect Christopher Wren. The longest running show in the world to date is The Mousetrap by Agatha Christie which has been running since 1952. The second longest runner is the musical Les Misérables which has been showing since 1985. There are various awards for West End theatre performers but the most coveted is the Laurence Olivier Award which is presented annually by the Society of London Theatre. Williamson designed posters for the London Underground from 1922-1939. Not all his work was as bright and uplifting as Brighter London for Theatreland. His early works featured scenes based on his experiences in the trenches during World War I where he sustained injury. These works have been displayed at the Royal Academy of Art where he was trained. While producing his more commercial works he became Headmaster of the Chelsea School of Art, employing Henry Moore to run his new sculpture department.